The fiber core of an active fiber is doped with laser-active ions, which are typically rare-earth ions (→ rare-earth-doped fibers). In the simplest case, the whole core is homogeneously doped with these ions, i.e., their density is constant throughout the core and zero outside the core. That assumption is sufficient for many models, but more generally we can deal with some doping profile, i.e., a doping density which typically depends only on the radial coordinate r. It is then described by a function NEr(r), if the fiber is erbium-doped. If the detailed doping profile is not known (as is the case for most commercially available active fibers), one normally assumes homogeneous doping of the core. See also our encyclopedia article on doping concentration. At this point, we need to think about how to describe the interaction of the laser-active ions with the light in the fiber. Generally, these ions have a ground state and some number of excited levels, which can either be metastable levels (with a substantial upper-state lifetime) or short-lived levels. Figure 1: Energy levels of Yb:YAG. At the first glance, the situation appears to be horribly complicated. First of all, the energy levels of such ions are grouped into the so-called Stark level manifolds, each one consisting of some number of sub-levels. The energies of the sub-levels within a manifold are somewhat different; the Stark level splitting is caused by local electric fields. In crystalline materials such as Yb:YAG, the active ions all have essentially the same microscopic surroundings, so that one can resolve the sub-levels in spectroscopic measurements (see Figure 1). Particularly in glasses as used for fibers, the microscopic environment of laser-active ions can vary substantially, and therefore also the level energies. Strictly speaking, every single ion has its own set of transition cross sections, and of course it is not practical to measure all such data in detail. In spectroscopic measurements, one only sees smeared-out absorption curves where one cannot resolve the sub-levels. Another aspect is that we have very high transition rates between the sub-levels within each manifold, caused by phonons (lattice vibrations) in the glass. These transitions cause a substantial level broadening (lifetime broadening) and quickly (on a picosecond time scale) establish a thermal equilibrium within each Stark level manifolds (but not between different manifolds). Figure 2: Energy levels and transitions in an ytterbium-doped gain medium. We consider only the total populations of the whole Stark level manifolds rather than these in specific sub-levels. Within each manifold, the mentioned non-radiative transitions very quickly establish a thermal equilibrium (according to a Boltzmann distribution), so that the model does not have to contain additional dynamic variables. For spontaneous emission, we also work with transition rates which are applicable to whole Stark level manifolds. These transition rates can also take into account multi-phonon transitions between the manifolds, which are relevant when the energy spacings of the manifolds are not significantly larger than the maximum phonon energy of the glass. Effectively, we don't care at all about the details of the sub-levels such as the statistical distribution of their energies or the fast phonon-mediated transitions between them! We just use effective cross sections as they result from measurements and do not need to know the exact physical origins. The usual quasi-three-level characteristics of the laser ions do not present a real difficulty for modeling; only the software must not use certain assumptions which are valid only for four-level gain media. By the way, by using effective transition cross sections which are a kind of average values for all laser-active ions, we implicitly assume that essentially all ions behave in the same way. If that is the case, we will obtain homogeneous gain saturation. Fortunately, most rare-earth-doped fibers exhibit such behavior. Gain systems with inhomogeneous saturation are very difficult to model, but fortunately not common in the area of fibers. Serious trouble arises only in cases where the mentioned assumption is not valid and rate equation modeling is not appropriate. That is the case for laser ions with strongly inhomogeneous behavior, as can occur for some neodymium doped fibers, for example (depending on the chemical glass composition). The problem is then that the pump wave at a certain wavelength may, for example, preferentially excite a certain set of ions which exhibits a certain gain spectrum, and pumping at the different wavelengths would excite other ions, leading to different gain spectrum. It is then not sufficient to consider only overall fractional excitation levels, as it matters which ions exactly get excited. In principle, one could make a model which distinguishes different types of such ions (depending on their microscopic surroundings); in practice, however, it will be very hard to get hold of the relevant spectroscopic data. 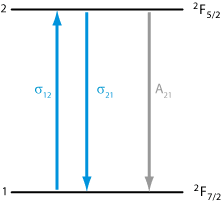 The state of the ions during operation is characterized only by the fractional populations of the Stark level manifolds – average values for certain small regions in the fiber, generally depending on r and z. Of course, these population values can depend on the local optical intensities. Their evolution can generally be described with rate equations, as are explained in our encyclopedia article on rate equation modeling. The steady state populations can be obtained simply by setting the time derivatives to 0 and solving the resulting equation system. As long as only absorption, spontaneous and stimulated emissions are involved, the equation system is linear, so that it can be solved easily. If there are nonlinear terms due to energy transfer processes, this becomes somewhat more difficult; one generally requires an iterative algorithm. In many cases, the model for laser-active ions can be further simplified, is only a single metastable level (Stark level manifold) is relevant. The simplest example for that is the Yb3+ ion. We have to consider only a ground state manifold (1) and a single excited state manifold (2) (see Figure 3). We call their fractional populations n1 and n2, and as there are no other levels, we know that n1 + n2 = 1: each ion can only be in one of these levels at a time. We then only need two functions for effective transition cross sections: σ12(λ) for absorption (transitions 1 → 2) of light and σ21(λ) for stimulated emission. The spontaneous transition rate A21 is the inverse upper-state lifetime τ2. Figure 3: Energy levels and transitions in an erbium-doped gain medium. One may think that erbium ions, having many more levels, are much more difficult to describe. That is not necessarily the case, however. Frequently, one pumps an erbium-doped fiber amplifier around 980 nm, transfering ions from level 1 (ground state) to 3 (see Figure 3). Usually, there is a quite fast non-radiative decay from level 3 to 2, involving the emission of multiple phonons. Considering that transition as infinitely fast, we can actually pretend to directly pump from level 1 to 2. 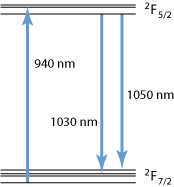 The relevant absorption cross sections are σ13(λ), and the emission cross sections are 0 in that case: pump light around 980 nm cannot bring ions back from 2 to 1. It could affect ions in level 3, but there are essentially no ions there. In conclusion, we can use exactly the same model as for ytterbium despite having more levels. Only in cases where either the mentioned non-radiative decay is slow (causing bottleneck effects) or additional levels are excited (e.g. via excited-state absorption), a model involving more levels is required. Neodymium-doped fibers can also usually be handled with the simplified model. Here, the final laser level is usually one which is substantially above the ground level (in terms of energy), but there is a rapid non-radiative transfer from there to the ground state. Effectively, there is no reabsorption on the laser transition; we have a pure four-level gain system. In the model, we just use zero cross sections for that absorption. Also, stimulated emission caused by pump light usually does not occur. Only the cases with inhomogeneous behavior (see above) are problematic. Some simpler software packages offer only the simple two-level model as described above, which is sufficient for many cases of interest, although not for all of them. The required spectroscopic data (see above) depend on the used fiber, of course; the user might only have to select a certain fiber, and the software can take the detailed data from some file. Advanced software packages, such as our product RP Fiber Power, offer the simplified type of model as well as an “extended gain model”, which can contain multiple excited levels and all the corresponding details. Our product can even handle cases with up to three different types of ions, which can even interact with each other. Therefore, one can treat essentially any laser-active ions, thus also the behavior of upconversion lasers, amplifiers with erbium/ytterbium codoped fibers with energy transfers, etc. Again, the user may simply select a certain fiber data set ones that has been prepared in the form of a text file. Such a file may, for example, be produced within the technical support based on data from a scientific publication. Therefore, the use of such software does not necessarily need to study all the details of the laser-active ions. Go to Part 5: Continuous-wave operation of amplifiers and lasers, or back to the start page.